We don't take for granted your visit, nor your call, or even more importantly, your decision to choose us as your security provider. Watch the fun video to understand why you should entrust A.S.A.P. Locksmith with your protection. We are the original ASAP, in business since 1993: Since we opened the doors of our first local shop in Hallandale 18 years ago, your security has been our #1 priority. Simply, we love what we do and our phones haven’t stopped ringing since. We don’t take our success for granted… every day we strive to make ourselves a better company in order to serve you best. Licensed, Bonded & Insured In today’s environment it is more important than ever to hire a security company that passes all of the necessary licensing, certifications, and insurance requirements mandated by law. 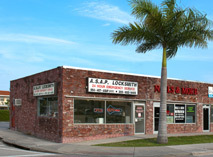 In South Florida, believe it or not, a Locksmith License is only required in Miami-Dade County. That means anyone can operate as a locksmith in Broward and Palm Beach without a license or background check… we’re talking about your security here. ALL of ASAP Locksmith technicians are Miami-Dade licensed, background checked and fingerprinted. 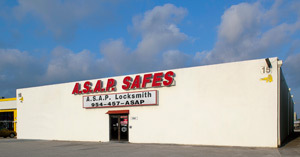 Our Broward and Palm Beach customers can rest assured when they choose ASAP Locksmith for their security needs. KNOW WHO TO TRUST! Medeco Security Center: Medeco is the leading manufacturer of High Security Locks in the world. The "Medeco Security Center" is an accolade only awarded to Locksmith companies that have a proven record of continuous quality service. We have been able to carry the honor for several years now, which allows us to have a direct line of communication with the most important lock security brand in America for the benefit of you, our customers. When it's about Medeco Locks, nobody better than us. Locally-Owned & Operated: You want your locksmith to be a Local Business. Regretfully, several unscrupulous individuals posing as professional locksmiths are using technology like the internet and flooding telephone directories for malicious intent to defraud and confuse you, the unsuspecting consumer. Locksmith Scams have been widely documented; one of their modus-operandi is to open an out-of-state office with hundreds of re-routed 1-800 numbers in as many cities using illegal tactics like deceptive advertising and identity theft to deviate service calls to their hideout locations. On the contrary, ASAP Locksmith has been locally-owned and operated since 1993 by the same owner with two brick-and-mortar locations. Please be aware that our reputable name has also been a target of these criminals by hijacking our company name on Google, Yellow Page Advertising and even 411 Directory Assistance. We implore you to protect yourself by programming our number into your phone so in an emergency you will not fall prey to scammers. 954-457-2727 / 305-932-4405. Background Checks: A basic rule of thumb for any security company is to perform background checks on all employees from technicians to office personnel. We abide by this rule and have had to reject more than a few candidates in the past stressing the importance of this procedure. Your Security is our responsibility…. And one that we take very seriously. Recognizable Vehicles and Uniforms: We provide professional uniforms to all our locksmiths and all of our vehicles are clearly recognizable with our logo design and company information. Why is this important? There are dozens of locksmith scammers stealing the genuine names and address of established companies, including ours. You will have the peace of mind when our technicians arrive wearing our company uniform and in a clearly identified service vehicle with our company logo and contact information. Always feel free to ask for their company ID. No Sub-ContRactors: We directly hire the most skillful technicians in the market — most have been with us for more than a decade! 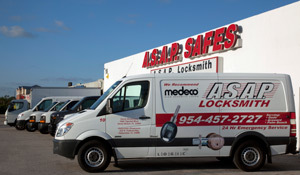 ASAP your Miami Locksmith continuously receive top notch technical training and are instilled with our honest work ethic. On the other hand, an unskilled locksmith will turn the simplest of tasks into an expensive mistake… and unfortunately, one that you will have to pay for. Illegitimate locksmith operations hire agents by long distance without background checks or skill tests whose only task is to show up at lockout service calls and charge as much as possible to unsuspecting consumers. We can’t say it enough, KNOW WHO TO TRUST! Two Locations to serve you: With two brick-and-mortar retail locations to serve you in Hallandale and Fort Lauderdale, ASAP Locksmith cuts keys, repairs locks and sells everything from decorative door hardware to sliding door locks, padlocks and more. Armando, our Hallandale Locksmith Store Manager, has been serving the community with a smile for the last 10 years and is truly an icon in the neighborhood. When residents need to secure their properties, they know who to turn to for expert advice. Our work is guaranteed: We are in it for the long run. Our business is based on your satisfaction. You’ll find the best door hardware and security products from the most reputable manufacturers in the field, professionally installed by our technicians, insuring quality, value, and reliability. We warranty our workmanship and only offer products from manufacturers that stand behind them. We are not the cheapest: Or are we? Don't fall prey to pricing designed to bait you. Why would you want to hire somebody who promises to do a $15-$25 dollar service call to then overcharge you in the most vulnerable moment; that is when cheap becomes more expensive. We pride ourselves in providing the best service in the industry and stand behind our competitive pricing. ASAP LOCKSMITH will always quote you prices BEFORE work is performed. When it comes down to it, you just might be saving hundreds by not going "cheap"!